We have previously shown that the intrabuccal administration of low and safe levels of electromagnetic fields, amplitude-modulated at a frequency of 42.7 Hz by means of a battery-powered portable device modifies the electroencephalographic activity of healthy subjects [1, 2], and is associated with subjective and objective relaxation effects . We have also shown that sequential administration of four insomnia-specific frequencies, including 42.7 Hz, results in a significant decrease in sleep latency and a significant increase in total sleep time in patients suffering from chronic insomnia [4, 5]. This approach has been termed Low Energy Emission Therapy (LEET). Dosimetric studies have shown that the amount of electromagnetic fields delivered to the brain with this approach is 100 to 1000 times lower than the amount of electromagnetic fields delivered by handheld cellular phones and does not result in any heating effect within the brain . The U.S. FDA has determined that such a device is not a significant risk device. A long-term follow-up survey of 807 patients who have received this therapy in the U.S., Europe and Asia revealed that the rate of adverse reactions were low and were not associated with increases in the incidence of malignancy or coronary heart disease . While many discoveries in medicine have evolved from a scientific rationale based on in vitro and in vivo findings, several seminal discoveries are the results of biological effects first observed in humans. For example, the development of modern cancer chemotherapy can be traced directly to the clinical observation that individuals exposed to mustard gas, a chemical warfare agent, had profound lymphoid and myeloid suppression. These observations led Goodman and Gilman to use this agent to treat cancer. Given the advantageous safety profile of athermal, non-ionizing radiofrequency electromagnetic fields and the emerging evidence that low levels of electromagnetic or electric fields may modify the growth of tumor cells [9–11], we hypothesized that the growth of human tumors might be sensitive to different but specific modulation frequencies. We tested this hypothesis through examination of a large number of patients with biopsy-proven cancer. Using a patient-based biofeedback approach we identified strikingly similar frequencies among patients with the same type of cancer and observed that patients with a different type of cancer had biofeedback responses to different frequencies. These findings provided strong support for our initial hypothesis. Following identification of tumor-specific frequencies in 163 patients with a diagnosis of cancer, we offered compassionate treatment to 28 patients with advanced cancer and limited palliative therapeutic options. We are reporting the results of our frequency discovery studies as well as the results of a feasibility study making use of Low Energy Emission Therapy in the treatment of cancer. Frequency discovery consists in the measurement of variations in skin electrical resistance, pulse amplitude and blood pressure. These measurements are conducted while individuals are exposed to low and safe levels of amplitude-modulated frequencies emitted by handheld devices. Exposure to these frequencies results in minimal absorption by the human body, which is well below international electromagnetic safety limits [12, 13]. Patients are lying on their back and are exposed to modulation frequencies generated by a frequency synthesizer as described below. Variations in the amplitude of the radial pulse were used as the primary method for frequency detection. They were defined as an increase in the amplitude of the pulse for one or more beats during scanning of frequencies from 0.1 to 114,000 Hz using increments of 100 Hz. Whenever a change in the amplitude of the pulse is observed, scanning is repeated using increasingly smaller steps, down to 10-3 Hz. Frequencies eliciting the best biofeedback responses, defined by the magnitude of increased amplitude and/or the number of beats with increased amplitude, were selected as tumor-specific frequencies. Block diagram of the novel emitting device making use of the Direct Digital Synthesis (DDS) technology http://www.analog.com/library/analogdialogue/archives/38-08/dds.html. This applicator was used for both the detection and administration of amplitude-modulated electromagnetic frequencies. RF: radiofrequency. Generation of amplitude-modulated electromagnetic fields: the device consists of a battery-driven radiofrequency (RF) electromagnetic field generator connected to a 1.5 meter long 50 Ohm coaxial cable, to the other end of which a spoon-shaped mouthpiece made of steel is connected with the inner conductor. The RF source of the device corresponds to a high-level amplitude-modulated class C amplifier operating at 27.12 MHz. The modulation frequency can be varied between 0.01 Hz and 150 kHz with a modulation depth of 85 ± 5%. The output signal is controlled by a microcontroller AT89S8252 (Atmel, Fribourg, Switzerland), i.e. duration of a session, sequence of modulation frequencies, and duration of each sequence are programmed prior to the treatment with a PC connected to the panel of the device. The RF output is adjusted to 100 mW into a 50 Ohm load using a sinusoidal modulated test signal, which results in an emitting power identical to that of the device used in the treatment of insomnia [4, 5]. Compassionate treatment of a 51 year old patient with ovarian cancer FIGO IIIC with extensive peritoneal carcinomatosis since October 1997. The patient received paclitaxel and cisplatin from March 97, then docetaxel and carboplatin, doxorubicin, and gemcitabine. Because of progression of disease the patient was offered compassionate treatment with amplitude-modulated electromagnetic fields as of May 05. As seen below, the initial treatment consisting of 15 frequencies (May 05) did not yield any response. Upon re examination, 11 additional frequencies (26) were added to the treatment program in August 05. Because of disease progression, treatment with single agent bevacizumab was initiated in November 05. Interestingly, the CA 125 level had decreased by 200 units prior to the initiation of bevacizumab. 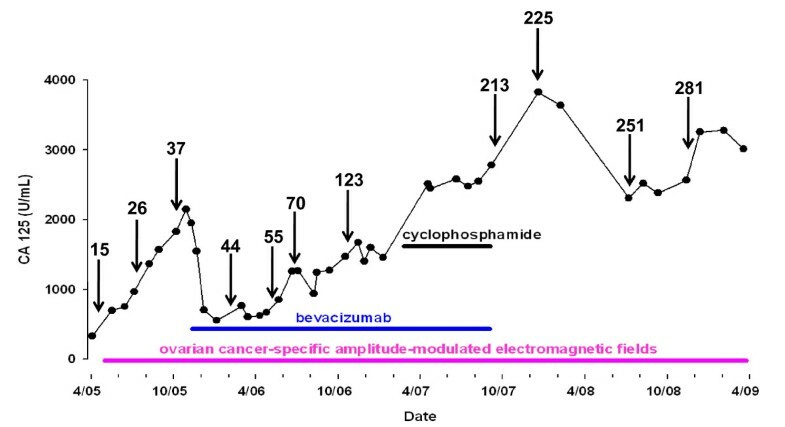 Combined treatment with amplitude-modulated electromagnetic fields and bevacizumab resulted in a decrease in CA 125 level from 2140 to 540 in May 06. Treatment was supplemented with cyclophosphamide from March to September 07. The patient was hospitalized with pneumonia and elected to only receive amplitude-modulated electromagnetic fields since September 07. As of April 09, i.e. 50.5 months after treatment initiation the patient has stable disease and is asymptomatic. The numbers above the arrows represent the total number of cancer-specific frequencies included in the treatment program. 59 yo postmenopausal female with ER/PR positive, ERBB2 negative breast cancer with biopsy confirmed metastasis to the left ischium and right adrenal gland. 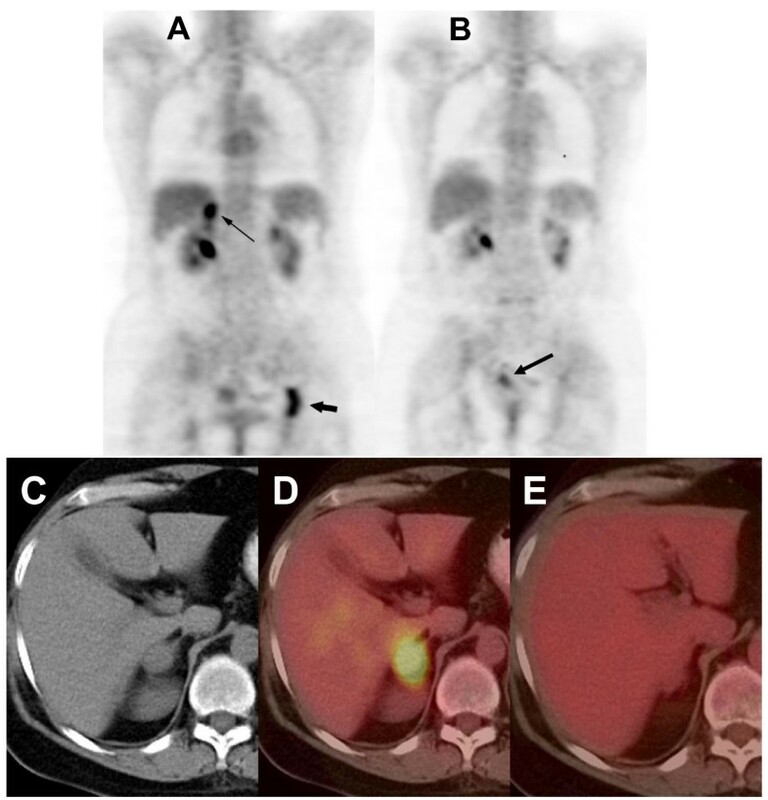 A) Baseline PET MIP image demonstrates metastatic disease of the right adrenal gland (small arrow) and the left ischium (large arrow). B) PET MIP image four months after baseline shows the FDG activity in the right adrenal and left ischium has resolved indicating response to therapy. However, a primary uterine tumor, which was barely detectable in the baseline study, grew during the same time frame (arrow). C) Baseline PET/CT (left panel): The non-contrast CT shows an enlarged right adrenal gland. D) Baseline PET/CT (right panel): The fused PET/CT demonstrates increased FDG activity in the enlarged right adrenal gland. E) Follow-up PET/CT: The fused PET/CT four months after baseline shows a decrease in FDG activity of the right adrenal gland. Note the corresponding decrease in size also. *** Duration of stable disease was +34.1 months (thyroid cancer metastatic to lung), 6.0 months (mesothelioma metastatic to abdomen), 5.1 months (Non-small cell lung cancer), 4.1 months (pancreatic cancer metastatic to liver), and 4.0 months (leiomyosarcoma metastatic to liver). **** One patient with ovarian cancer had progressive disease while receiving 26 frequencies. She has now stable disease and has been receiving amplitude-modulated electromagnetic fields for +50.5 months (Figure 2). Not included is a patient with breast cancer metastatic to bone and liver with a near complete response who started systemic chemotherapy with docetaxel and bevacizumab within 4 weeks of experimental treatment initiation. The objective responses observed suggest that electromagnetic fields amplitude-modulated at tumor-specific frequencies may have a therapeutic effect. Of the seven patients with metastatic breast cancer, one had a complete response lasting 11 months, another one a partial response lasting 13.5 months. These data provide a strong rationale to further study this novel therapy in breast cancer. The increased knowledge of tumor-specific frequencies and the preliminary evidence that additional tumor-specific frequencies may yield a therapeutic benefit (Figure 2) provides a strong rationale for the novel concept that administration of a large number of tumor-specific frequencies obtained through the follow-up of numerous patients may result in long-term disease control. This hypothesis is partially supported by two long-term survivors reported in this study, a patient with thyroid cancer metastatic to the lung with stable disease for +34.1 months and a heavily pretreated patient with ovarian carcinoma and peritoneal carcinomatosis with stable disease for +50.5 months. Additional support for this hypothesis stems from the observation that four patients with advanced hepatocellular carcinoma in a follow-up phase II study by Costa et al had a partial response, two of them lasting more than 35 months. These exciting results provide hope that this novel therapeutic approach may yield long-term disease control of advanced cancer. Kirson et al have recently reported the use of continuous wave (CW) electric fields between 100 KHz to 1 MHz [10, 11]. These fields were CW, applied at relative high field strengths but lower frequencies than the fields used in our study. These frequencies were found to be effective when applied by insulating external electrodes to animal cancer models and patients with recurrent glioblastoma. In contrast to our approach, the electric fields applied to cancer cells and patients did not include any amplitude modulation. Hence, it is likely that these two different therapeutic modalities have different mechanisms of action. Computer simulation studies have shown that the specific absorption rate (SAR) in the head resulting from the use of intrabuccally-administered amplitude-modulated electromagnetic fields is in the range of 0.1–100 mW/kg. Hence, the SAR outside the head is substantially below 0.1 mW/kg. We had previously hypothesized that the mechanism of action of electromagnetic fields amplitude-modulated at insomnia-specific frequencies was due to modification in ions and neurotransmitters, as demonstrated in animal models, as such biological effects had been reported at comparable SARs. However, this hypothesis does not provide a satisfactory explanation for the clinical results observed in patients with advanced cancer. First, the levels of electromagnetic fields delivered to organs such as the liver, adrenal gland, prostate and hip bones, are substantially lower than the levels delivered to the head. Second, there is currently no acceptable rationale for a systemic anti-tumor effect that would involve subtle changes in neurotransmitters and ions within the central nervous system. Consequently, we hypothesize that the systemic changes (pulse amplitude, blood pressure, skin resistivity) observed while patients are exposed to tumor-specific frequencies are the reflection of a systemic effect generated by these frequencies. These observations suggest that electromagnetic fields, which are amplitude-modulated at tumor-specific frequencies, do not act solely on tumors but may have wide-ranging effects on tumor host interactions, e.g. immune modulation. The exciting results from this study provide a strong rationale to study the mechanism of action of tumor-specific frequencies in vitro and in animal models, which may lead to the discovery of novel pathways controlling cancer growth.